So you want to know how to publish a book. Well there are several methods you can utilize to get your grand idea into the hands of hungry readers. Let’s take a look at some of them. Traditional publishing: This involves having a literary agent that shops your manuscript around to the Big Six publishers and hopefully gets you a contract. Some of the pluses here are that your name will be associated with one of the remaining large international publishing houses. The minus for that is, you will have to locate the literary agent and shop your book to them. You will also have to have your own marketing plan created and ready to implement in order for the large publishing houses to even look at you. You see they want you to still do all the leg work and generate the sales from your books and they’ll end up with your “fans” and you’ll just get the associated name. If you’re into that, hey there are worse ways to make a living – but remember they rarely accept “untested” writers so if you’re new; prepare for a long arduous journey to stardom. Independent publishing: This is also called self-publishing. This method is the fastest and also becoming the most utilized method for getting books published. Basically, you write the book, you hire an editor (or do it yourself) to proofread your book for grammatical, and thematic errors. Then you select a self-publishing company (aka DIY publishing). You pick the “package” you can afford and voila! You are a published author. The plus here is that you have total control over your product. The minuses are still that you have to have a marketing plan and you still do the leg work for selling your book. The difference is that while you won’t have the “association” you will keep more of your profits. eBook publishing: This is still a relatively new method of creating books however, it will eventually become the norm as technology continues to move forward. eBooks are created to be read either online using your computer or using specific text readers like Kindle, Nook etc. The books are created using specific software programs and are marketed in the “stores” for the specific readers where the books can be read. The pluses fall under the “virgin territory” realm as this is still emerging technology. The minuses fall into the “cost-effectiveness” category as you must find ways to distribute your eBooks. There are companies that will automatically convert your publications into eBook formats for extra cost as well as companies that only create eBooks for all formats. Again you must research these companies for the best publishing price. Membership publishing: Again this is a relatively new form of publishing but the concept is an old one. Basically you create a membership site and you publish your books in a sort of blog format. You can sell your memberships to either be “all inclusive” meaning they pay for the whole book and can download it from the site or read it there after logging in; or you can sell them a chapter at a time for a minimal price, say $.99. Which may seem strange to you; but if you think about it – most books contain at least 10 chapters in them which means you made $9.90 for your book. Imagine how much that changes if you have a book with 12 or 15 chapters in it. Think about the regular cost of buying a book in the store. You may not be able to get away with pricing your book for $19.99 if it’s a paperback right off the bat; but if you have 24 chapters and your members are paying $.99 a chapter to read it as it unfold like a soap opera; you made $23.76 on that same book that you would have normally priced at $9.99 or $12.99. 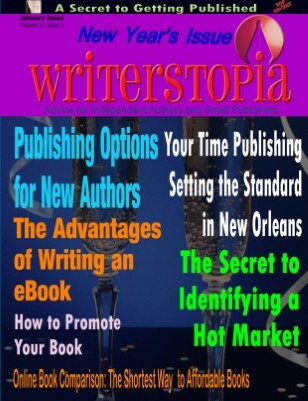 These are just some of the ways you can get your books published and turn a profit. Always keep in mind though that whether you go with a large publisher, a small publisher or do it yourself you must have a marketing plan in order to find the people looking for your book.